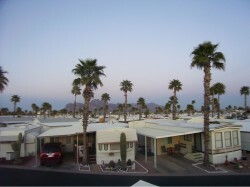 The whole focus of this site is the experience of living in a 55+ RV Resort Park in a warmer climate through the winter months. 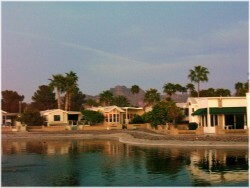 There are literally hundreds of these parks in the state of Arizona offering a wide array of amenities and lifestyle experiences. But there are also some important differences. The medium and larger sized parks are pretty standard in terms of layout, security, and central facilities. Some smaller parks are more for the very budget conscious and those who are not interested in paying for a lot of things they don't use. It is all about individual choice. Most parks separate the 'pets allowed' area from the 'no pet' area. We all know that model small town doesn't really exist outside of Hollywood. But these parks have come about as close to that imaginary feeling as I have seen. The clean paved streets with mostly bicycle and pedestrian activity combined with the friendly greetings present a very comfortable atmosphere. Nearly all the parks are designed with a similar layout. Streets of park models surrounding central facilities. And they are truly 'communities' onto themselves. There is a strong community feeling in most of the parks as people live together in a type of small town atmosphere. Everyone is very friendly and quick to help a neighbor. "We knew about these parks and had considered trying it out to see if we liked that experience. I was quite reluctant because I didn't feel quite ready for 'what I perceived to be' the lifestyle. To my surprise I felt quite at home and very comfortable. And my privacy was very well in hand. Sure everyone is friendly and says 'hello' but no pressure to join or participate. Or, lots to participate in if that is what you want. And I was shocked that I actually enjoyed living in a "trailer". Never thought that would happen." It's interesting how all these people from all these different places and backgrounds come together with the common bond of just wanting to live life as enjoyable as possible. There is not a lot of discussion about who you 'used to be'. Really not that many actually care. Whether you were successful in your career or just survived it doesn't really matter. Status seeking is not very evident. It's like there no longer is any value in trying to impress the neighbors. "It may be hard to change later"
A major consideration when deciding to 'try out' a park is that you may be choosing a new 'home town'. It is noticeable how many park residents would find it unthinkable (well almost) to move to a different park. It becomes a home and it is sometimes hard to leave because you have become part of a community. Of course those with bad experiences will be happy to leave. But once you develop a bit of a community social life it can be difficult to start over again in another 'community'. You make friends and develop relationships with neighbors. You get involved in group and club activity and that can be hard to leave. While some people have spent their lives moving to different communities and don't worry about making new friends and such, many of us get attached to our location and find a move more difficult. And, to some, the older you are the less you search for the new adventure associated with moving from your community. Choose carefully ... you may not want to change later. You should make sure you are moving to a park that has the facilities, services, and the things to do that meet your needs and interests. Most of the larger parks have websites and we have listed them in the parks listing and links sections. The parks do a good job of listing their facilities and usually show pictures so you can get an idea of what is available. The park facilities include both the functional (laundry, office, security, etc) and those related to park activities such as swimming pools, hot tubs, workshops, and the like. And of course basic services such as mail service, access to the internet and cable TV, as well as maintenance and support. 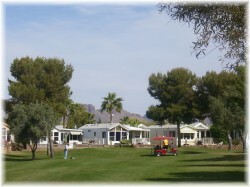 There are a huge assortment of facilities in some of the parks; Recreation Centers, Exercise Rooms, Laundry, Swimming pools, Hot Tubs, Libraries, Workshops, Card Rooms, Tennis Courts, Pickleball Courts, Computer Rooms, and on and on. Very large parks will even have Grocery Stores, Restaurants, Driving Ranges/Putting Greens, and maybe a Golf Course. You want to know that the facilities are in good condition and things work as they are intended. You also want to know that the park is clean and well maintained. The Activities - "What is there to do?" 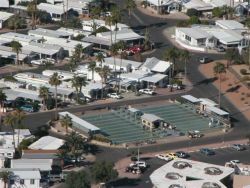 That old clich� ... 'You can be as busy as you want to be' ... certainly fits the concept of the RV Resort trailer parks. Tennis, Dancing, Golf, Billiards, Pickle ball, Concerts, Shuffleboard, Horseshoes, Lapidary, Silversmithing, Wood Working, Quilting, Card Games, Ping Pong, Ceramics and Pottery, Book Clubs, Service Clubs, Church Services, Movies, Water Aerobics, Yoga, Pilates, Painting, Computer Club, Choirs, Musical Groups, and more. The last thing you need to worry about is having enough to do. 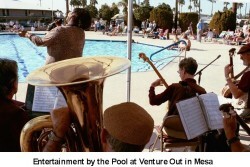 When choosing a park location the activities are critical if you want to match your particular interests and lifestyle. If playing horseshoes is your thing then look for horseshoe pits. If tennis is your game then make sure there are adequate tennis courts. If you are a 'lap swimmer' then make sure the pool(s) can accommodate that. "We blew it on this one. We like playing tennis and bought a park model in a park without tennis courts. But thought it was such a good deal and we can drive to tennis courts. Now we are sorry. But love the old park model and love the neighbors. Now what?" While you may feel you can travel outside the park to participate in activities (and certainly you can) you may not be so inclined once you take up residence. It seems that park residents develop a lifestyle that becomes more 'small town'. It becomes habit to walk to things and/or ride your bike. You may strongly regret that you chose a park where you needed to fire up the family vehicle and head off into the city traffic to participate in your favorite activity. have absolutely no interest in that activity. Most park sites will list at least the most common activities and you should check out the list. If information is not shown or your interests don't appear but other park attributes are appealing then you may want to take the trouble to contact the park. The parks have someone in charge of activities. This is often a volunteer resident but could also be a park employee. Contact them to discuss your interests. If their name and contact information is not shown on the site then contact the park office. They are usually more than anxious to accommodate and promote all they have to offer. In some cases the parks are hungry to have residents that like to organize and spend their time getting people together for new activities. If you are that type of person then you may be able to start your own 'unique' activity. Ask if that is allowed and supported. There are a lot of considerations regarding the location of the park. Most of them are personal and depends on what appeals to you and how you like to spend your time outside of the park. The larger parks are really quite self-sufficient and you will probably be surprised how little you travel out. But of course you will want to shop, eat out, golf, and take in the whole array of adventures and entertainment in the area. The best way to get a sense of the park's location is, of course, on a map. But you can also get that lovely satellite view of the actual park and see what the layout looks like, from above of course. On the parks chart you can click on the location city name and go to the google map view. There you can see the general proximity to major locations and roadworks. You can then click on the satellite view and go down for a good look of the park. Keep in mind that you are actually having to consider TWO community locations. (1) The location of your park model within the park 'community' and (2) the location of your park within the larger community. Check out the park security. We all care about the safety and security of our homes. And of course your winter home is just as important. This is even more important to those of us who come from smaller or rural communities into a strange place and maybe even find big cities a little scary. parks is the 24 hour security. who comes into the park. Many parks have regular (usually weekly) publications describing park news, events and activities. Usually done by resident volunteers. 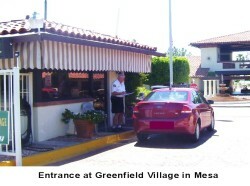 They are a good source of resident information but also provide a bit of the 'flavor' of park life. Getting a copy(s) of these journals can contribute to your information package when deciding on a park location. Some parks place the copies of the park paper on their websites. Worth checking. Watch out for the Rules! Before committing to residence (especially if buying a park model) make sure you get a copy of the park rules and even take the trouble to (at least) phone the park office to discuss arrangements and clarify rules of residence. Rules are important and you should want the park to have them. But within reason. You should look for a park that has rules that you appreciate if you are making it your (part-time) home. You will want to feel some comfort in knowing that security and other aspects are important to the park management. But you will also want to make sure you do not lose your lifestyle independence with over-zealous park management. It is common for parks to have rules governing security, cleanliness, quiet, and general good conduct. And most parks do an excellent job of maintaining these standards. If you are not moving into a 'resident owned' park then you will be at the mercy of the park owners and management. They get to make the rules and of course rules are important. But, some are more reasonable than others. Our sense was that the park management really didn't want to encourage residents renting out their units. Whether that was an overzealous attempt in trying to maintain more control over who was staying in the park or an attempt to limit competition for the park owned rentals I am not sure." There is a tendency to think you have bought a residence just like buying a house back home. But you need to remember that you only bought the park model. And you parked that unit in an RV park. It may have already been parked there when you bought it but it is really no different than when you rent a spot at a campground ... just a much, much longer stay. When you pay for the annual rent of the lot that is the only timeframe you have agreement for. The park owner can refuse to rent it to you the next year and then you have a problem. That may be rare but it is legally possible. A park model is not a house. A park model trailer is legally a vehicle and is likely to depreciate rather than appreciate. Many parks have a rule on the age (and condition) of trailers being moved into their parks. And some requirements regarding the upkeep of the park models. It is very common that parks will not allow a park model older than (say) ten years to move into the park. They of course want to maintain high standards. This is understandable but also is an important issue to consider when you buy a unit. It is certainly rare that park operators refuse to renew rental agreements because of park model age. But it has happened. This doesn't mean to suggest that an older budget-priced park model is a bad buy. In fact, it can be quite the opposite. But you do need to view your purchase similar to buying an old car compared to a new car. It will depreciate and it will require some more work and maintenance. And when you are done with it you may not recover your original price. An old car may have to be sent to the wrecker when you are done with it. An old trailer could have the same fate. Some parks will require that you do not sell your unit (while parked on their lot) without offering the park owner a first right of refusal. You come up with a buyer at a price and then are required to inform the park operator of the deal. The park operator may decide they want to buy it at that price ... and have the right to do so as long as it is being parked in their park. Another rule that is worth knowing about. Some parks will limit you to renting only one lot. What that can mean is that you cannot buy that nice, newer, place next door and then decide to rent out your older unit. It can even mean that when you buy a different unit in the park you need to immediately have yours sold or you could end up breaking the rule of limitation to one rented lot. Of course park operators will generally be reasonable but it can also be a rule that hits you by surprise. Planning to Buy a 'Fixer-Upper' and Rebuild that Old Park Model Yourself? Many parks will have rules that do not allow you to do any major renovation work yourself. If the work involves anything that requires a municipal permit they may insist that you hire a licensed contractor. Of course most owners will do smaller jobs themselves and that is not a problem, in fact it is probably encouraged. But it is worth checking for these rules if you have any plans to redo that older unit. It can be a real unhappy surprise later on.